Crown your Thanksgiving table with a turkey centerpiece handmade by your little one! She'll have a blast coloring the little guy in, and feel so proud to see her creation gracing the table. Give him a helpful worksheet on the use of nouns, with a Thanksgiving twist! 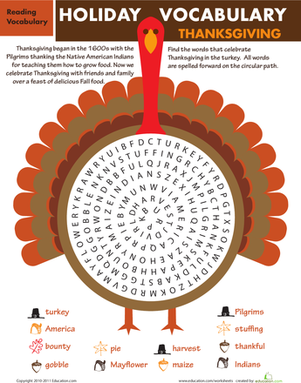 Help your kid learn about Thanksgiving with this colorful word search printable.